What is the author's tone as he writes? Can you tell what situation the author finds himself in? What do you learn about God, His character, and His dealings with men in this Psalm? What are some ways you can apply this Psalm to your life? What truths does this Psalm contain that transcend time and culture? Click on the Bible study picture to get started on this lesson today! Keep working through this mini study of the Psalms! Don't let the busyness of the Christmas season keep you away from the Word. Run to Jesus and seek Him today! 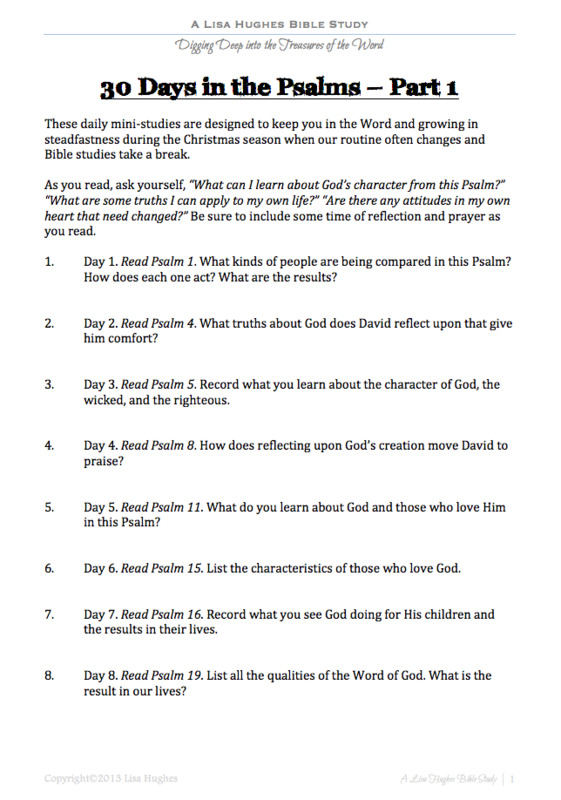 These mini studies were designed specifically for the Christmas season when our regular Bible study routine often changes. Each study directs you to take a deeper look at one or two aspects of the psalm. You could stop there or use it as a springboard to look deeper yourself. Look for more things you can observe about the Psalm itself and what the author conveys. If you get stuck ask yourself "What can I learn about God's character from this Psalm?" "What are some truths I can apply to my own life?" "Does this Psalm reveal any attitudes in my own heart that need changed?" ust click on the picture of the Bible study and you'll be on your way to downloading or printing it out!